Argentinian countertenor Franco Fagioli is causing a sensation in the world of classical music. His three octave range, from low tenor to high soprano, incorporates both the falsetto and modal registers in a way unheard of in the traditions of the countertenor voice. 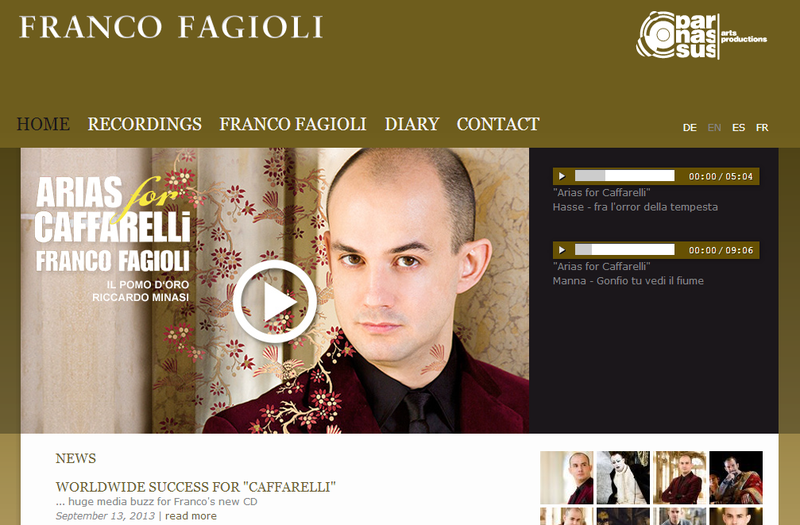 Franco Fagioli is universally recognised as one of the finest countertenors performing today. His voice, with its huge three-octave range, has been unanimously praised for its beauty, while his dazzling virtuoso technique has set new performance standards. His Giulio Cesare in Zurich (2005) caused a sensation, repeated in Oslo (2007) and Karlsruhe (2008). 2009 saw widely-acclaimed performances as Demetrio in Handel’sBerenice (conducted by Alan Curtis, and also released on Virgin Classics), and of Handel’sTeseo under Konrad Junghänel at the Stuttgart Staatsoper (available from Carus/SWR as a live CD recording). In Stuttgart he also gave his first European solo recital : a sell-out performance that received a standing ovation. He then made a notable return to his homeland as the lead in Gluck’s Orfeo ed Euridice at the Teatro Colón, and as Telemaco in the Argentinian premiere of Monteverdi’s Il ritorno d’Ulisse in patria for Buenos Aires Lírica. The 2011/12 season saw many appearances in concert (Froville, Heidelberg, Karlsruhe:Gala der Countertenöre, Schwetzingen, Dortmund: Pergolesi’s Stabat Mater, Budapest: J C Bach’s La Tempesta) and new productions of Giulio Cesare (at the Helsinki Opera), Poro(title-role for the Hallische Händel Festspiele) and Rinaldo (Teatro Colón). He showed extraordinary versatility in performing the soprano role of Arbace in Hasse’s Artaserse at Martina Franca in July (a role written for Farinelli), and, a month later at the Salzburg Festival under Marc Minkowski, singing another of Handel’s demanding alto castrato leads, Andronico in Tamerlano. The present season began with a hugely successful project: the production, tour and recording (on Virgin Classics) of a rediscovered masterpiece, Leonardo Vinci’s last operaArtaserse (1730, setting a very similar libretto to Hasse), in which Fagioli again sang the bravura role of Arbace, originally conceived for another great castrato, Giovanni Carestini. This was a succès fou in France, Germany and Austria, receiving ecstatic reviews and a standing ovation at every venue. Further highly applauded performances have included the sacred: Handel’s Solomon at the Theater an der Wien and Jommelli’s Isacco, figura del Redentore in Salzburg; and the secular: Aci in Porpora’s Polifemo (another Farinelli role), and an appearance as soloist at the annual gala concert for the German AIDS Foundation. During the early summer he sings Bertarido in Handel’s Rodelinda in Krakow, and then recitals with the Accademia Montis Regalis under Alessandro de Marchi. 2013/14 opens with the release of an important recording celebrating the legacy of the castrato Gaetano Majorano, called Caffarelli, Farinelli’s supremely talented rival, as notorious for his off-stage antics as for his onstage successes: almost all tracks on this CD are world premiere recordings, and it promises to be a major event of the recording calendar. There will also be a series of concerts linked to this recording. Onstage, Fagioli will sing Athamas in a new production of Handel’s Semele at the Cuvilliers Theatre, Munich, Riccardo Primo at the Badisches Staatstheater, further performances of Vinci’sArtaserse in France, Germany and the Netherlands, and Sesto in Mozart’s La Clemenza di Tito. He further expands his repertoire with a new concert programme exploring music written for the last of the operatic castrati, Giambattista Velluti.